Huggins and Scott's first Masterpiece Auction of 2013 has begun with the bidding closing on Thursday night, February 7th, with the 30-minute rule beginning at 11:00 pm eastern time. This auction features another amazing array of sports and non-sports items that caters to every level of collector and investor. Whether you only want to spend a few hundred dollars or several thousand dollars, our selection of quality items has a little something for just about everyone. This auction is headlined by Lots #1-44 – The Barry T. Malkin "In Memoriam" Collection. Former Washington, DC Police Captain (and Huggins and Scott's employee) passed away on October 15, 2012 and we are pleased to honor his wishes of auctioning his personal collection. 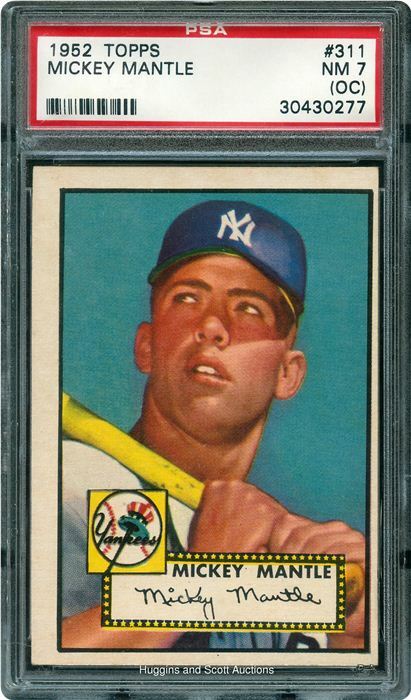 It is headlined by a stunning 1952 Topps Mickey Mantle RC, graded a NM 7 (oc) by PSA. Card collectors will enjoy an abundance of 19th and 20th century rarities including professionally graded and raw examples of cards from a variety of designations, including a collection of tough-to-find 1923 Billiken Cuban cards with John "Pop" Lloyd; an attractive E122 Babe Ruth, the #15 PSA registered 1934 Goudey Baseball complete set; a complete 1933 Goudey set; a variety of T205 Gold Borders, T206 White Borders and more. The post-war collection is substantial as well with a 1949 Bowman Baseball completely PSA graded near set; a number of 1952 Topps baseball high numbers in multiple lots, a tremendous collection of Richie Ashburn oddball cards including the scarce 1967 Topps Standup Test issue and more. As always, we also present a plethora of wonderful "shoebox" collections (always a crowd favorite). Other artifacts in this auction include a terrific selection of various years, styles and teams of game-used warm-up jackets including a neat early Boston Braves and New York Giants baseball; game used bats from Ernie Banks, Michael Jordan, Ryan Zimmerman (all with PSA/DNA LOA's) and a 1949 Eddie Yost game used Senators signed jersey. Staying in the memorabilia category, we are pleased to offer a wonderful collection of game programs and tickets, including a stunning 1937 World Series program signed by Lou Gehrig, Joe DiMaggio, Tony Lazzeri and others; numerous graded and raw World Series tickets including a 1920 Ebbets Field Press ticket; several early World Series programs including 1924, 1926, 1927, 1930 and many more. We have been consigned Walter Payton's 1979 Illinois Driver's License, along with several gorgeous Payton autographs; a variety of signed full-sized and mini helmets from Hall of Famers and Heisman Trophy winners; and a nice 1967 Green Bay Packers team-signed football with Lombardi. As with all of Huggins and Scott Auctions, we have a large number of autographed lots including baseballs, bats, lithographs, photographs and others consigned by collectors from all across the country. Highlights include: one of the most gorgeous Jimmy Collins signed index card you'll ever see (with an inscription); a signed Cap Anson letter; a Grover Cleveland Alexander hand-written and signed letter; a scarce Joe Giard (1927 Yankees) signed cut from a baseball; a beautiful signed Babe Ruth check; a baseball signed by the cast of "Pride of the Yankees" with Ruth, Gary Cooper and Teresa Wright; a 1926-27 baseball signed by Ruth, Cobb, W. Johnson, Griffith and more; a stunning 1957 AL All-Star Team signed baseball from the personal collection of Billy Pierce; and a possibly unique Grover Cleveland Alexander signed W517 baseball card. If coins, political or Americana collecting is your hobby, this auction features a number of terrific lots including a 1904 $20.00 "Double Eagle" Gold Piece; a beautiful Barack Obama signed Chicago Bears display; a pair of Neal Armstrong signed pieces; a signed Gus Grissom photograph; a signed Elvis Presley Tour Program and much more. To browse the auction or to download the catalog, please visit the website: www.hugginsandscott.com.